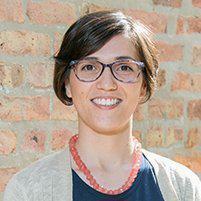 Dr. Kat Aleman is the managing chiropractor at Kindred Chiropractic in Chicago, IL where she serves the Wicker Park neighborhood. She has a Doctorate of Chiropractic (DC) and is licensed as a chiropractor in Illinois. As a chiropractic care provider, Dr. Aleman is trained in the healing arts. Her skills focus on the nervous system with respect to the spinal column. Through chiropractic treatment, Dr. Kat Aleman helps care for all other body systems that are interconnected to the nervous system. Services provided by Dr. Kat Aleman vary depending on the needs of the individual. Kindred Chiropractic is located less than a half-mile from the Damen Blue Line stop, 2 blocks off of North Avenue and is extremely close to the 606 trail. Prior to becoming a chiropractor Dr. Kat Aleman grew up in Michigan. As a high school student, she experienced daily headaches to the point that she was taking medications every day in order to cope. At the same time, Dr. Aleman was working as a chiropractic assistant. She discovered first-hand the benefits of chiropractic treatment for headaches. Her headaches went away, as did the daily medications, and she found her passion for a career in chiropractic medicine.